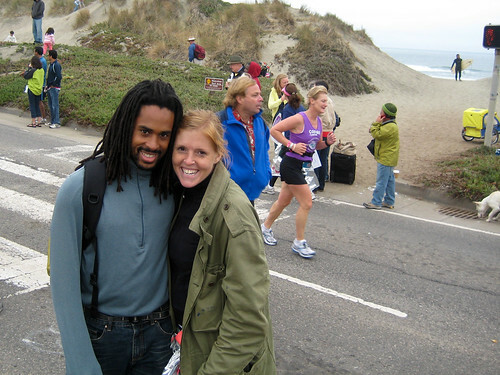 On Sunday I ran the Nike Women's Half-Marathon in San Francisco for the 2nd year in a row (well, the third, if you count that I did it in 2006 as the first half of the FULL marathon!). Last year, I PR'd on this course, which is insanely hard. Obviously I hadn't been pushing hard enough during easier (read: flatter) races. Anyhoo, I went out yesterday just 3 weeks after Berlin and not having run more than a few miles since then. I started out all gung-ho (with the 9:44 pace group, natch) and at about mile 3 my legs firmly indicated that they were having none of it. About halfway through, up yet another ginormous hill, I decided to relax and enjoy the race, which meant taking the uphills easy, pushing a bit on the downhills, and smiling a lot. And also not trying to beat last year's 2:12 finish, which I think was an excellent decision, especially given how sore my calves were this morning anyway. I finished in 2:19 and I had fun doing it. After the race, we spent about 2 hours cheering the full-marathoners until we were hoarse. We met new friends (hi Lin!) for lunch in Mountain View, then went home and drank wine and ordered pizza (because we were really and truly too tired to move - there was almost a fight over who would answer the doorbell when the delivery arrived) and caught up on True Blood. It was kind of perfect. Aaah! You need to add a warning when you're going to be posting California pictures. Some of us are homesick. Congratulations, it sounds like a great run! Congratulations!! You did awesome. I can't believe you ran those hills. 2:19 is amazing. Way to go G!